MAKE YOUR FESTIVAL STAND OUT! Your festival listing will be highlighted and hyperlinked in 4 different media products: website, e-Guide, print magazine, and digital magazine! Step 1. 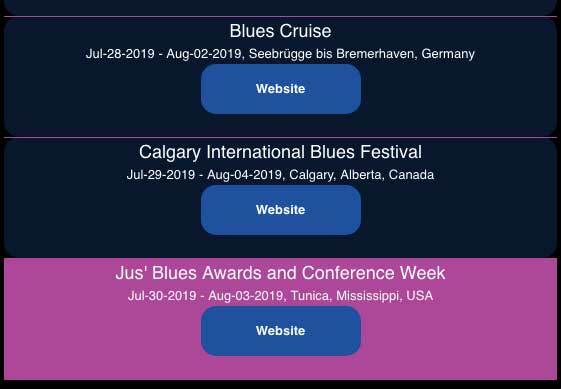 Post your festival in the festival calendar on our top-ranking website: www.bluesfestivalguide.com (no need to wait until you know your complete line-up, we just need your dates and venue. Your festival listing will be seen by thousands of visitors each month! Easy and free. Step 2. Let us know that you want your festival to be HIGHLIGHTED and we will send you a proposal and invoice. Step 3. Your Festival posting will be highlighted and hyperlinked on www.BluesFestivalGuide.com immediately, and also in the weekly e-Guide newsletter calendar (weekly electronic newsletter with 30,000 subscribers) several weeks before your event date. Step 4. Your Highlighted Festival will then be copied into the back section of the print magazine (annual magazine with 100,000 free circulation throughout U.S. and Canada) in the festival calendar.